Add a touch of wickedness to your womens gothic attire with one of these gothic corsets or gothic vests. Ranging from patterned sweetheart overbust corsets to ruffled gothic waist cinchers to womens formal buttoned vests, we have something to suit the needs of any woman. Made from fine materials such as satin, cotton, silk, and leather, many of these gothic corsets display ornate brocade patterns, floral lace, or decorative chains, spikes, and buckles. Check out our variety of colors of womens gothic underbusts, as well as our styles of womens gothic overbusts with and without shoulder straps. Our womens gothic vests embrace styles from vintage to modern, making them an easy addition to womens gothic formalwear. For a superb period look with a gothic twist, be sure to browse through our gothic corsets with bustles or skirt additions. You are sure to find something of interest in this category of gothic overbusts, gothic underbusts, gothic waist cinchers, and gothic vests! A fantastic way to create a flattering silhouette, the Athena Black Satin Underbust Corset is a gorgeous piece to add to any outfit. The sleek black satin corset comes in a long line design ideal for those with longer torsos. A fantastic way to create a flattering silhouette, the Athena Black Satin Zipper Underbust Corset is a gorgeous piece to add to any outfit. The sleek black satin corset comes in a long line design ideal for those with longer torsos. A gorgeous addition to any Neo-Victorian ensemble, the Bernia Black Leather Underbust Corset hugs your torso to create a flattering silhouette. The sleek steampunk underbust corset is made from soft, high-quality napa leather. Boys are not the only ones to enjoy the purring of a well-tuned motorcycle or the freedom of the open road. The Biker Black Vinyl Underbust Corset is a gorgeous accessory for any lady who wants to create a flattering silhouette. 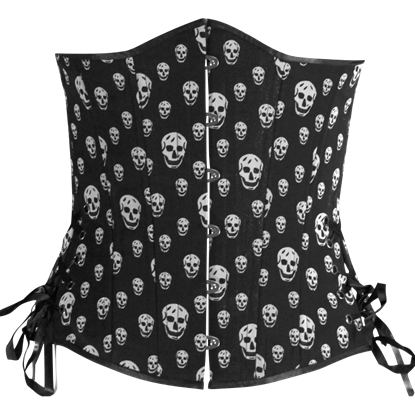 Whether you are looking for the perfect addition to your gothic punk ensemble or want a great corset for Halloween, the Black and White Skull Underbust Corset makes a fantastic choice with its grinning skull pattern. Accentuate the beauty of your natural curves with the help of this elegant underbust corset. The Black Brocade Waist Training Underbust Corset can be worn with many other colors in your closet for a fantastic look. The epitome of dark elegance, the Black Canvas Waspie Waist Cincher is the perfect corset for adding a conservatively gothic flair to any outfit! This waspie style waist cincher is a fine piece of womens attire for all occasions. Revel in the classic beauty of this quality corset! The Black Classic Brocade Overbust Corset displays a delicate pattern in jet black brocade, making it a flexible and fashionable choice for your wardrobe. This corset is unique in that it has two laces in the front and one in the back. This allows for great adjustability and the perfect fit. Our Black Under-Bust Corset is fully lined and reinforced with durable steel boning for support. Revel in the splendor of the Victorian age with the Black Double-Buckled Brocade Overbust Corset. This corset displays a patterned black brocade with silver metal buckle details across its midriff and sides. Secure your title as reigning gothic queen with the fun closure details of the Black Faux Leather Buckled Strap Waspie. This stylish gothic waist cincher features four adjustable chunky metal buckles over its front zipper closure. This corset is best defined as simple elegance at its finest. The Black Floral Brocade Overbust Corset is constructed with near peerless quality and features a style that will compliment any look, be it casual, formal, or anything else.